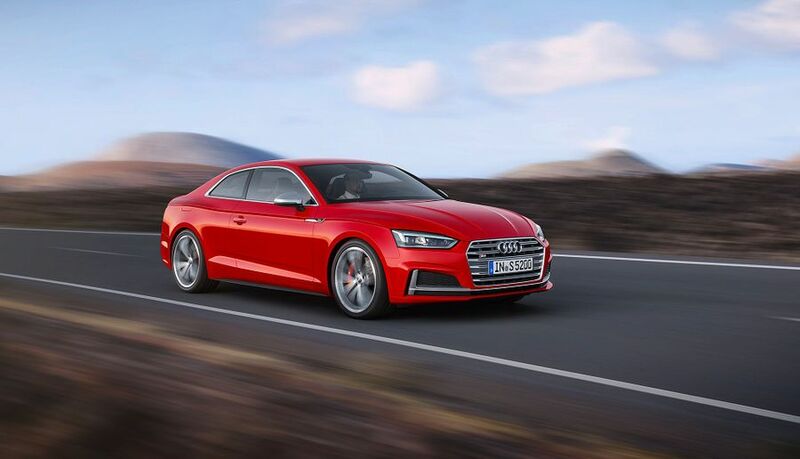 The Audi S5 is a beautifully built luxury coupe that looks understated, offers lots of hi-tech equipment and practicality, and provides strong pace in easy-going comfort. There’s no denying its performance is impressive, but the way it delivers this power isn’t particularly exciting. If you’re looking for a coupe that involves, entertains and offers a dynamic edge, we’d shop elsewhere. It’s the Audi A4, albeit in a sharper suit. 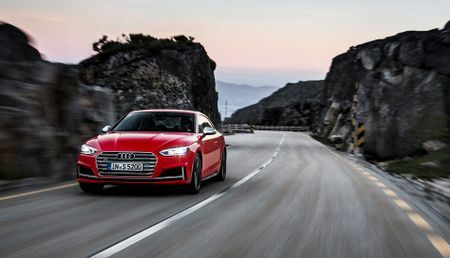 The two-door coupe version of Audi’s popular saloon was first launched in 2007, and now there’s an all-new model. That’s right, contrary to what your eyes may be telling you, this is no facelift, and the S5 is the model that fulfills the performance brief before the monstrous Audi RS5 arrives in 2017. The Audi S5 sits 23mm lower than the regular A5, and brandishes signature badges, matt aluminium grille, aluminium-look door mirrors and oval tailpipes. It also features 19-inch five-spoke wheels, re-profiled bumpers, side inlet grilles, a rear diffuser, chrome inlays within the door handles, and gloss black calipers (red is also optional), featuring an embossed S logo. 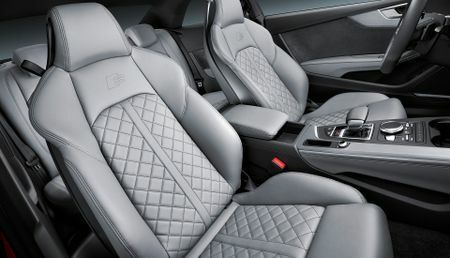 Inside, the upgrades include a three-spoke multifunction steering wheel, quilted nappa leather sports seats with a massage function, and a fixed eight-inch screen that is begging to be touched, but can only be controlled via Audi’s rotary dial. Thankfully, the changes beneath the skin are more noticeable. 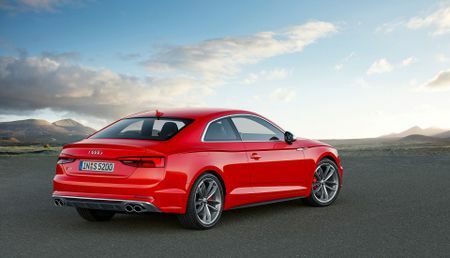 Gone is the supercharged 3.0-litre V6 used in the previous Audi S5, replaced with a new, lighter turbocharged 3.0-litre V6, gaining both power (349bhp) and torque (369lb ft). Our Tango Red test car also featured a raft of optional extras, including the brilliant head-up display (£900), a sport differential (£1,200), privacy glass (£375), dynamic steering (£950), S suspension with active damping (£900) and the Bang and Olufsen 3D sound system (£750). Fast, but never thrilling. There’s no doubt this is a rapid way to travel: 0-62mph takes a lag free 4.7secs, which is 0.2 secs faster than its predecessor, and the car has an electronically limited top speed of 155mph. Yet despite being 60kg lighter than its predecessor, the 1615kg S5 is no spring chicken. The performance is so exploitable from low revs, and the mechanical grip so prodigious, that you could certainly take some unsuspecting scalps on a British B-road. Trouble is, we’re not sure how much fun you’d be having as it never really feels fast. Such is the level of refinement in both the cabin and powertrain, the S5 feels quite aloof from the low set driver’s seat. The suspension is taut and planted in all three damper settings, while the optional dynamic steering – which varies its gear ratio depending on speed and steering angle to feel more alert – lacks any notion of feedback. It all feels a bit safe and secure rather than playful and engaging – a rear-wheel-drive BMW 4 Series Coupe would be much more engaging to drive. The gearbox also frustrates in the way it can deliver super-quick upshifts, then slur and stutter on a downshift. So despite the performance on offer, you never really feel compelled to push the envelope. Talking about pushing the envelope, we’re disappointed to see the extremely incremental upgrade to the S5’s design. Sure, there must be a case for ‘if it isn’t broke, don’t fix it’, but we were hopeful Audi would consider upping the aesthetic ante. Similarly, the interior remains strong on practicality, with seating for four adults, a 465-litre boot, and 40:20:40 split-folding rear seats, but this is an area where Audi has historically overachieved. Not anymore, and the gap to Mercedes-Benz and BMW is quickly closing. If you like your fast coupes to be subtle, the Audi S5 is a paragon of restraint and understatement. It’s stylish, refined and practical, but it lacks in overall excitement and herein lies the problem. 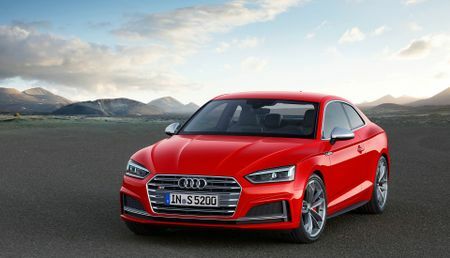 With so much competition, not to mention the imminent arrival of the Audi RS5, you get the impression the S5 could end up becoming a handsome footnote. Similarly matched coupe from Mercedes-AMG also uses a turbocharged 3.0-litre V6 turbo, four-wheel drive, and manages 0-62mph in 4.7secs. Loses time over both the S5 and C43 with a 0-62mph of 5secs, but it’s the more playful, thanks to its rear-wheel drive setup. Faster, feistier and pricier option that uses a naturally aspirated 5.0-litre V8 and offers leftfield charm in abundance. Interested in buying an Audi S5?